This is a post by TCC Team Member Dale Drinnon. 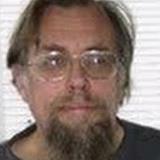 Dale has a degree in Anthropology with a background in Zoology and Paleontology. Now the question is, are the supporters of this alleged incident providing trustworthy reports of their claim? Well, the first thing I had noticed was that the illustration is ripped off of another report from Canada and reproduced without credit: I had previously posted the report and the illustration on my blog with due credit and so I recognized it. 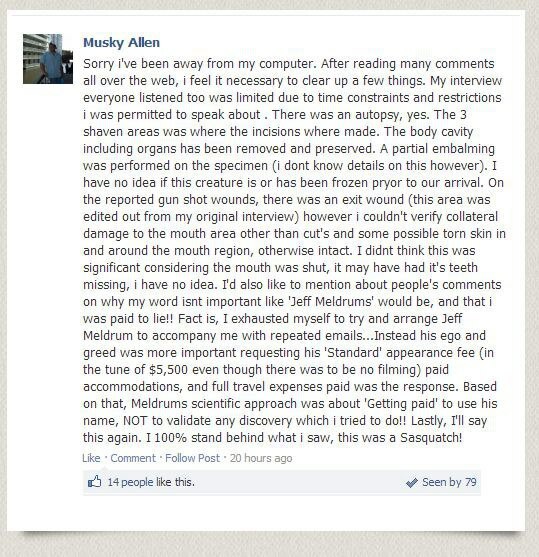 So the representation that this is "Their" Bigfoot body is already fraudulent and a deliberate attempt at deception while using somebody else's illustration in a manner the artist certainly would not have intended.Then there is a protracted matter of why their expert was one Musky Allen (of no especial credentials and no especial standing in either the Scientific nor yet in the Bigfooting community) instead of a previously-proposed Dr Don Jeffrey Meldrum. The answer was interesting in that it pointed up further lies and evasions. 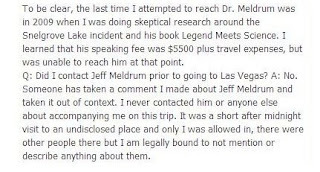 It definitely seems that Musky lied about his communications to Dr. Meldrum and that Dr. Meldrum called him on the allegation. 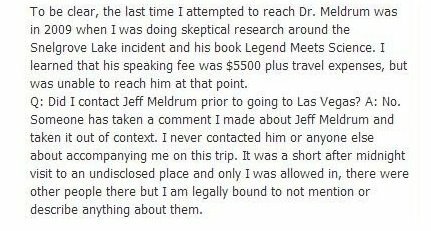 It seems Dr Meldrum carried the day and that furthermore Musky is not to be trusted, as Dr Meldrum says in his statement. This particular exchange does not question Rick Dyer directly, but it does completely undermine the reliability of the witness he called upon for support of his position and expert testimony, when obviously he provides neither. Without Musky's word on it, we are left with Dyer's word alone, and actually that much alone is not good enough. He is already suspect from his involvement in the 2008 hoax when a different supposed Bigfoot body turned out to be a costume in an abandoned refrigerator with some entrails added to give the exhibit the air of authority. Well done. I have to say that when I look at this whole thing, it seems to me like the world's best ever before-a-movie-comes-out promo, igniting hysteria in the BF world like "The Fourth Kind" did with aliens. It's almost a metaphor for what's happening in the community of subjects studied for the film. It's "War of the Worlds" to hype up a movie before release utilizing the very mechanics occurring in the subject of the movie. Brilliant PR. I WISH BIGFOOT BLOGS WOULD STOP TALKING ABOUT DYER ONCE THEY FIND OUT HE IS ENVOLVED WITH ANYTHING,I GET SICK EVERYTIME I HERE HIS NAME.